My general MO for recipes is to start from a legitimate recipe out of a dead-tree book or the Internet (usually with 10 or fewer ingredients) and then cut as many corners as possible to speed up the process without arriving at taste ruination. This grilled fish recipe ended up being a home run with very little effort. The glaze is a sweet-plus-salty caramelization with no crazy ingredients. 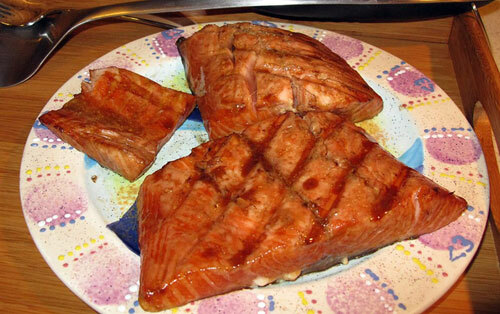 salmon fillets of even thickness, 3/4" - 1"
Remove lingering bones from the fish. If any portion is much thinner than the rest, cut into a separate fillet and plan to cook the mini-fish for less time. In a small bowl, thoroughly mix the soy sauce, sugar, oil, and water together. Put salmon fillets into a freezer bag. Pour marinade into bag and marinate in the fridge for 30 minutes with the scales up. Begin cooking rice in the rice cooker that you really should own by now. Preheat your grill for 10 minutes at the highest temperature, and scrape grill as smoothly as possible. Grill scales up for 6 minutes without bothering it like a little brother. Flip and grill the other side for 4 minutes. Reduce time slightly for thinner fillets. Remove from heat and let sit for a few minutes, scales down. Flake meat away from scales with a fork and devour with rice.